Costs – See what the cost of tree services are in Greensboro, North Carolina so you can have an estimate in mind when you call the professionals. FAQs – As you prepare for tree care season in Greensboro, have you considered what you might plant to replace or add on to your tree landscape? Do you know North Carolina’s state tree? What trees thrive in your area? Learn about this and more with this guide to trees in the area. Services – Find a tree service professional in Greensboro to answer more of your questions or get to work on your trees. How Much Do Tree Services Cost in Greensboro? Shade trees are an important part of the landscape in Greensboro, North Carolina. They clear the air, beautify the neighborhood and raise property values. However, trees must be maintained and, if necessary, removed altogether. The cost of tree maintenance and removal services varies by location. Here are the average prices for tree services in the city of Greensboro. Sometimes, trees must be removed from the property altogether, often due to disease, death or severe storm damage. The average cost of tree removal in Greensboro, North Carolina is about $575, and usually no more than $680. Tree removal can be more affordable if the site is convenient, the tree is small and the work doesn’t take too long. For difficult jobs and the toughest and tallest trees, however, the price of removal could exceed $1,100. If it becomes necessary to remove a tree from the property, the next service homeowners will need is stump removal. Most tree removal companies consider this part of the job as an additional service. Having a midsize stump removed in Greensboro may cost as little as $75. For a large stump, the price may be a little higher, but most won’t pay more than about $132 to have a single stump ground up and removed from their property. Maintaining trees is essential not only for preserving their natural beauty, but also their health and the safety of human inhabitants. Timely maintenance services such as pruning, fertilizing and staking will extend the life of a tree and enhance its long-term value. In North Carolina, the average price for tree maintenance services is $730. The most common range is between $600 and $860, although some have paid as little as $200. The maximum cost reported by residents is $1,660. 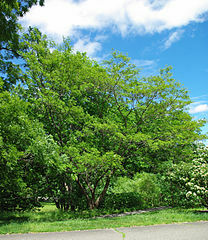 A bustling urban zone in the northern Piedmont of North Carolina, Greensboro hosts the relatively mild ecology of the northern inner Piedmont, suitable for growing many different kinds of trees. The white oak is the official municipal tree of Greensboro. It earned the designation due to its local abundance, regional importance as a natural resource and historical significance on the Piedmont frontier. Guilford County is home to a prodigious number of large trees over 100 feet tall, including a variety of oak, hickory, elm and poplar species. The city of Greensboro houses one of the oldest post oak trees on record. Greensboro also boasts the oldest specimen of North Carolina’s state tree – the longleaf pine. The longleaf pine is a famous native of the Southeast, capable of living up to 250 years. It is the longest-living southern pine. The municipal government in Greensboro employs an Urban Forester to enforce its tree laws. While there are extensive rules that guide landscaping and tree conservation for new development, single-family residences are largely exempt from these ordinances. 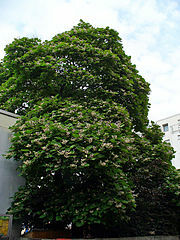 Homeowners do, however, need to maintain the appearance and health of those trees on their lot that are planted adjacent to a public right-of-way, such as the street or sidewalk. The City will pay for the maintenance and removal of such trees as it deems necessary, but is not responsible for any hazards that persist solely on private property. Typical of the Southeastern U.S., Greensboro lies in a humid subtropical zone. Each of the seasons is pronounced, with warm, wet summers and cold, dry winters. About 900 feet above sea level, the city enjoys a mild climate tempered by the Appalachian Mountains to its north and west. Its USDA Hardiness Zone is 7b. The surrounding northern Piedmont features rolling hills and fertile farmland, with a growing season shorter than the coastal plains but longer than the mountains. Native trees are those naturalized to the Piedmont during the pre-colonial era. Greensboro growers who are interested in tree fruit cultivation have a variety of choices. Apples, pears and chestnuts can be grown throughout the state. Late-blooming plums, figs, persimmons and pecans can be grown in the Piedmont without much trouble. Cold-hardy varieties of nectarines and peaches are viable, although they are notably high maintenance. Strawberries and other berries are grown here, too, but keep in mind they sometimes succumb to fungal diseases brought on by the rains. In recent years, Greensboro has suffered severe droughts, making drought-tolerant species ideal. The region averages one or two major droughts lasting more than four years about every century. Tree growers should also beware of diseases and pests that could affect their cultivars. Dutch elm disease in North Carolina was first discovered in Greensboro several decades ago and continues to haunt the American and European elms of the Piedmont. Additionally, the widely disruptive emerald ash borer was sighted in North Carolina for the first time in 2013, posing a threat to area ash trees.